Description: When not in bloom the plant adds interest to rock gardens or a sunny perennial border, each variety has interesting foliage characteristics: brown/burgundy leaves; or bright gold spiky stems; or large purply black leaves. 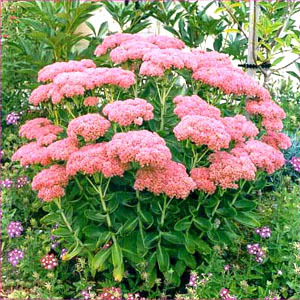 Outstanding Features: Sedum is tolerant of heat, humidity, drought and neglect. Tips: Divide every 3 to 5 years to discourage crown rot. Planting Instructions: Plant in spring, spacing plants 6 inches to 2 feet apart, depending on the variety. Prepare the garden bed by using a garden fork or tiller to loosen the soil to a depth of 12 to 15 inches, then mix in a 2- to 4-inch layer of compost. Dig a hole twice the diameter of the pot the plant is in. Carefully remove the plant from its container and place it in the hole so the top of the root ball is level with the soil surface. Carefully fill in around the root ball and firm the soil gently. Water thoroughly.